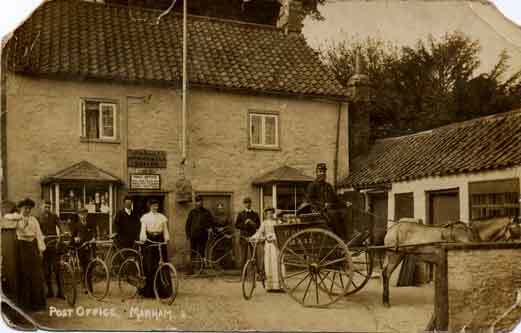 This photograph is thought to have been taken outside the Post Office at Marham in Norfolk, England about the year 1903. Although the exact date upon which it was taken has not been established, the man seated on the gig (dressed in a Postman’s uniform) is known to be Thomas Gooderson. Thomas was a Norfolk rural postman who was born in 1843 and who died in 1918. The photograph has been supplied by John B. Gooderson, of Churt near Farnham in Surrey, who is a great-grandson of Thomas.